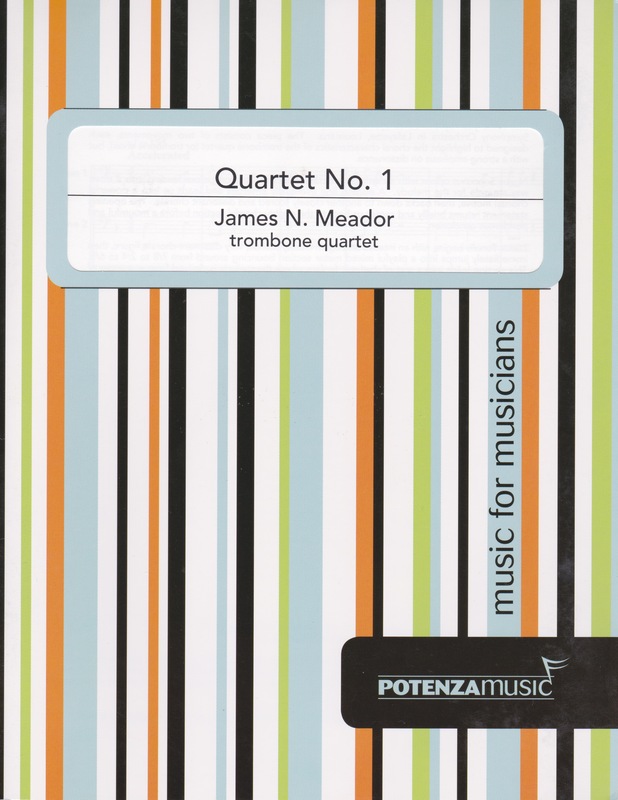 James Meador’s Quartet No.1 is an exciting work that emphasizes the choral characteristics of the trombone ensemble. Presented in two fast-paced and dissonant movements, this piece is equally effective whether performed by a quartet or a large trombone choir. The piece was written in 2004 and premiered the same year by the University of Louisville Lafayette Trombone Quartet. The first movement contains several pyramid figures and other rhythmically interdependent parts that will help any trombone ensemble strengthen its fundamental skills of playing in time and matching articulation. It moves along quickly at 55 beats per minute in 4/4 time. The technical difficulty of the parts is manageable, so players will find the fast pace of the movement reasonable. The second movement presents more challenging rhythm with mixed meters changing frequently between 7/8, 2/4, and 6/8. All players must achieve mastery of playing in the fast 7/8 meter, but there are many homorhythmic passages to help unify rhythmic presentation across the ensemble. The melody is most often presented in the first part. Both movements require all players to demonstrate musical independence throughout. The full range of the composition extends from A to a1, but the tessitura of each individual part is quite contained. All parts are clearly printed and presented in bass clef. The level of this piece is perfect for a college trombone quartet or trombone choir.